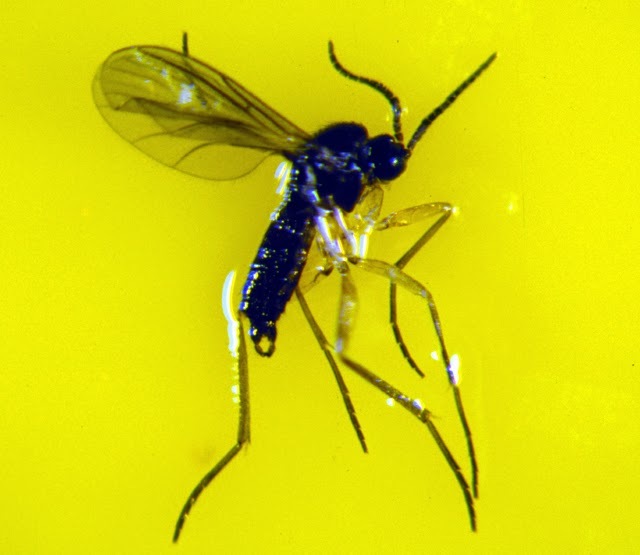 Fungus gnats are also members of the fly family, usually about 1 millimeter in size. They can be recognized by their all-black, rather "skinny" bodies, compared to that of fruit flies. 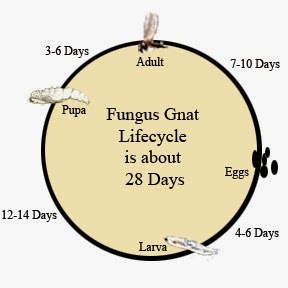 Fungus gnats are attracted to moisture and fungus, and are therefore attracted to compost bins and can sometimes be observed crawling on the bedding in a worm or compost bin. The soil in which houseplants are potted can also provide an environment in which fungus gnats can flourish. If they are present in your houseplants, this indicates that there is too much moisture in the potting mix. Try letting the plants dry out completely before the next watering. This will kill the larval stages in the soil.